Simple recipe for making baharat kabobs. While grill is warming you can skewer the kabobs, alternating with what ever vegetables you would like to add. In this case I used bell pepper and onion. Set up your grill for indirect cooking or on a gas grill set the grill on low heat. In this case I put the kabobs in the smoking chamber of my smoker. On a kettle grill simply place the kabobs on the cool side. 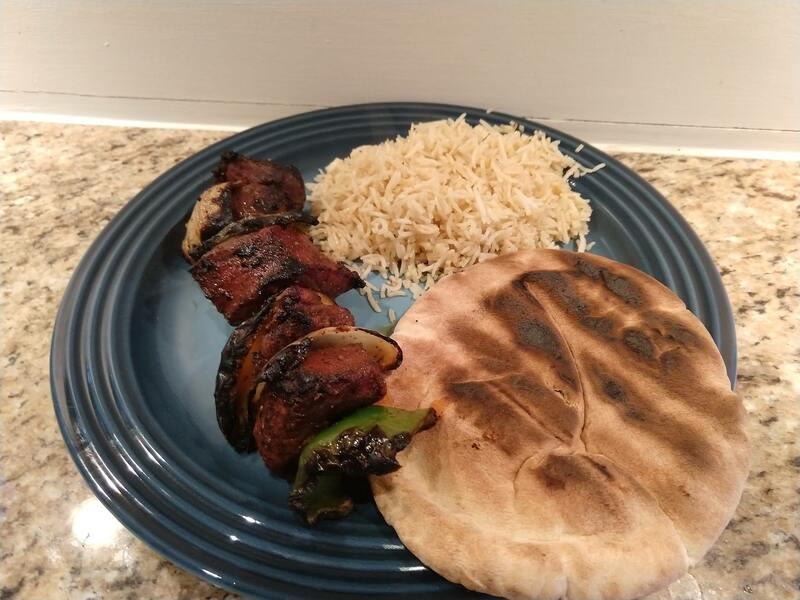 cook the kabobs on low for 15-30 minutes. If the temps are under 300 you can cook for 30 minutes. If the temp is higher you will need to cook for less time. Transfer the kabobs to direct heat and sear them to finish turning often to avoid burning. For a gas grill simply crank the heat to the highest setting. For a grill or smoker cook directly over fire. This will take about 5-10 minutes depending on the desired doneness. Make sure to pull them before fully finished as they will finish coming to temp while resting. After cooking cover/wrap the kabobs in foil and let rest for 10-15 minutes.